Where is it, then? And why does it seem so difficult to live the life of your dreams, while for others it seems so natural and effortless? To live the life of your dreams is natural, but not effortless. You must put some effort in changing your perspectives and old programs in order to reach a different result. But it’s natural, yes. We are all born with the natural ability to change and to bring awareness to our life. Therefore, it’s not that difficult. It just calls for dedication. So, where is the key, then, that opens that magic door? It’s exactly where you are now. You are the very key that opens that door. You’re right. So, the easiest part has just begun! Now, let’s get the whole thing done! The effort required is basically about acknowledgment and openness. Trust and existence. Can you do it? You must be open to see a new inner world and let the changes happen. There isn’t a lot more to do besides acknowledging that there is a whole universe behind that door. But you must open it. And enter. And be within. It’s not the world outside you that is going to heal you and bring you joy and accomplishments. It sure looks like that, because that’s the way we have been programmed to understand the world. But in truth, the so dreamed happiness is within. Then, yes, it shines and reflects outside and comes back to you (in different shapes and categories), which may make you think it’s all coming from outside. You create your thoughts, and thoughts are energy. What you think and feel inside shapes your external life. Not the other way. In other words, you and every one of us create our own reality from inside out. And that reality also influences the rest of the world, and reflects back on us. That’s an important thing to consider, isn’t it? How we are creating and accessing our inner world is the foundation for what we are experiencing emotionally, mentally and physically. And affects our outer world, as well. Most of us have a very active imagination. We have the power to visualize all sort of things, even to create images in our minds of things that (still) don’t exist in our reality. Many people create negative, painful, frightening images. Why? Maybe because they have been conditioned to do so (watching the news, for example, is a fabulous way to have the mind conditioned to go on negative tracks). Here is a real example of how people create their own distresses. There were severe storms around this area (northern Illinois) a couple of weeks ago. Wind gusts were over 60 mph and hail up to the size of golf balls, said some reports. The tornado warning came on in my cell phone, and the siren went off in town advising the population to take shelter. I did what I had to do (practical and common-sense steps in a situation like that); and I also talked to the wind/tornado. This may sound a little weird to you, but talking to Nature is a common thing to me. It’s one way to connect to Source, and keeps me calm, balanced, and safe. In less than 15 minutes the storm had passed. It was before eleven o’clock at night; the warning would still be effective until 1 a.m. but things looked good. I went to bed. Soon enough even the rain had stopped. Next day I talked to my sister about the storm. She told me the very first thing that came to her mind was the sad scenes of loss and desperation that so many people face in situations like that. Her heart beat accelerated and she felt anxious and frightened just in thinking of those scenes, imagining that something similar could have happened to me, her little sister! Now, do you see where I’m going with this? Do you notice the waste of energy in thinking scary thoughts? Nothing really bad happened. In fact the tornado just touched the ground somewhere not too close to me, and dissipated. No damages. Still, my sister’s reaction was based rather on distressing feelings caused by thoughts of bad scenes than on positive thoughts of gratitude and happiness, for all was well. Like many people, my sister concerned about something that she, herself, created. Her mind made up those scary disaster images (based, of course, on images she had already seen on the news before – so they stuck to her mind causing fear and all sort of uncomfortable feelings). Imagine this kind of mental behavior occurring often in a person’s life. And it does, for most people. It increases their stress level, blood pressure rate, and overall discomfort. Now, imagine not only one person’s life; but a whole family, because habits get passed along. Then a social group. Soon enough that mental behavior becomes cultural, and ingrained in the whole society. And in general, in the whole world. Generation after generation. Wondering why so many people are still unhappy? People are afraid of people, of Nature, and of things they don’t know; they are worried about the political, economical, and social situation; about global warming, wars, money, health, everything! How do you think one can be healthy and happy living in such a constant state of fear, worries, and mental stiffness? No wonder life becomes a heavy load for them! People even create images and hypothetical situations just to be worried about! They don’t even realize they do that! Because deep inside they (we all) have been programmed that life is hard and dangerous; and not fair. And not fun. And in order to survive one must fear and distrust everything and everyone. That’s a safety measure. Well, that’s the conception, anyway. What these people don’t know is that being fearful is not, by any means, a safety measure. Au contraire! Negative thoughts affect you negatively; likewise, positive thoughts affect you positively. Not because of the thoughts themselves, but mainly because of the way they raise or lower your personal vibration. When your energy vibrates low, you attract more low-vibration things to your life. When your energy vibrates high, you attract high-vibration things. That’s the core reason for keeping up the good thoughts. Besides acknowledging where you are and where you want to be, and being open to changes, the next steps to raise your vibration and open the door to a beautiful life is to TRUST and BE the beautiful life you dream of. Carrying those heavy, dark, fearful, unfavorable thoughts is the opposite of that. Just think. Only YOU can make the changes you want to see in your life. You must use your own power to focus on the good parts of your fairy tale and make it brilliant, lovely, happily ever after. It’s all in you. The scary thoughts, and the enlightened ones, too. Maybe it’s time to stop conjuring up all sort of bad, painful things that could happen, and be open to the beauty that is actually happening, right now. Instead of using your personal energy and power of visualization to create more trouble for yourself, use it to create beautiful thoughts; thoughts of love and connection to the Universe. Thoughts of trust and balance. What would you like to see in your life? Even if you think of something that seems impossible or not feasible at the moment, spend some time with it. It’s more productive to visualize a pleasant situation than put a damper on it. Let the soul expand. Expansion leads to Light; conversely, restriction and constraint leads to shrinking and annihilation. Even if you feel silly doing that, because you may believe visualization doesn’t lead to manifestation, it’s okay. Do it anyway. 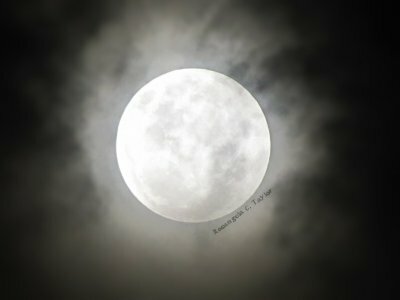 I have a strong reason to say so: if you are going to spend some time and personal energy with thoughts and visualizations that bring you a sense of “I can’t”, frustration, lack, anxiety, stress, fear and discomfort – which are very unhealthy and unnecessary, why wouldn’t you instead just use the same time and energy to visualize something better? I’m not saying that what you are visualizing will manifest in your life (neither the bad, nor the good things – but chances are they might, just because of the vibration you are in). In any case, the point here is just to relax and have a better time rather than feeding low vibes. It’s the same amount of effort (if not more) to think negative thoughts in comparison to thinking in a more positive and enlightened way. One brings pain and emotional distress; the other, calm, trust, and love. In doubt, just remember: you are the key that opens the door to a better life. You create your thoughts, and thoughts are energy. What you think and feel inside shapes your external life. Not the other way. Happiness is not where we have been programmed to believe it is: in things and events, money, relationships, etc. Changing pace and raising your vibration will naturally bring you happiness. I know, it sounds way too simple to be effective, but don’t be there wondering and doubting, just try it! There is nothing to lose – guaranteed! Sure, all those external things are great and give us joy. I love money, success, beauty, great relationships, and all sort of physical improvement and accomplishment. In fact, they all are bi-products of raising our vibration. So, by bringing spiritual awareness to our days we are not dismissing the good and fun things of material life. We are, indirectly, inviting them in. After all, we are here to enjoy all things we can experience as a human being. But, focusing on that only is what causes the frustration, because they are incomplete. So, stop desiring a life of happiness from that standpoint. Understand, also, that the more you long for happiness the more you become negative and hopeless, because longing does not bring it. Otherwise you’d have got it already, right? Longing (anything, as a matter of fact) is only a sad reminder that we don’t have it, and that generates frustration and scarcity feelings. Not good magnets for happiness. Not at all. Instead, just accept life as having its ups and downs, acknowledging that neither situation is permanent. Don’t dwell on what you don’t have or are, while claiming you are seeking happiness. Stop doing both. When I was a teenager I used to be really upset when things were not the way I wanted them to be. Trying to make me understand what I couldn’t yet, my mother used to say, “There is no evil that forever persists, nor good that forever exists”. Of course, her intention was to make me feel better by knowing that bad situations shall pass. But in fact, I’d feel even worse because then even the good things would not last, either! Instead of seeking happiness, it’s a better idea to seek awareness and gratitude. They will bring you to a more enlightened state of mind and spirit, which, in turn will make you happy. No matter what might be happening around. Relieve yourself of the pressure or necessity to always feel good, happy, accomplished, healthy, rich, beautiful, whatever you have in mind. Pressure does not take you to an enlightened state; just pushes you further away from what you want the most. The solution is: relax and stop seeking happiness, because it’s not anywhere else besides in yourself. So, open that door. Be your own fairy. Or Elf, if you will. Go inside yourself and clean up your soul. Move energy. Get rid of what is stagnant and what isn’t beneficial anymore. Revive. Spruce up that tale. It’s yours! Live your creation with joy! Start now, with my wishes for an inspired and lovely day! 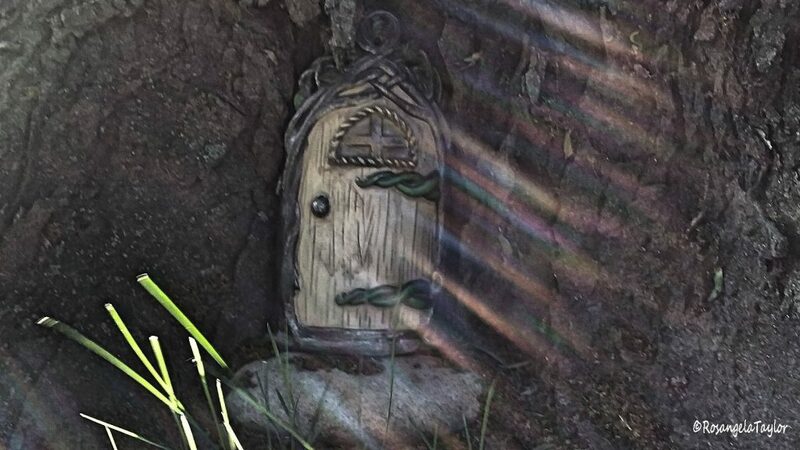 “Fairy-Tale Door” by Rosangela Taylor.